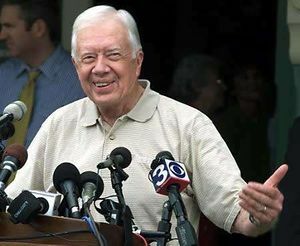 Jimmy Carter is a former President of the United States. Current House Representative Hilda L. Solis worked in the Carter Administration White House Office of Hispanic Affairs as an intern. 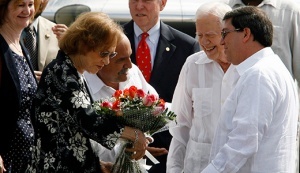 Former U.S. President Carter, whose Center has monitored elections in Venezuela, expressed his condolences in a statement recognizing Chávez’s success in cutting the poverty rate in Venezuela by half. A march and rally marking the 50th anniversary of Rev. Martin Luther King, Jr.'s March on Washington on Capitol Hill, beginning a day of events recalling the historic 1963 civil-rights demonstration. Jimmy Carter with Christine Ahn November 2018. This page was last modified on 14 March 2019, at 05:32.